You wanna add your "Useful Pages"? CLICK ME! Hmm… you're editing this page, aren't you. I can't show you this function due to prevent accidents.This super awesome function is created by Boyu12! Please reload the page if the tool doesn't be displayed. How to introduce this tool. Copy the following code and paste it in your sandbox page. Special Containment Procedure: SCP-4016 is currently contained in a specialized chamber at Site-32, equipped with furnishings similar to those present in its location of discovery. Access to the entity is restricted to Level-2 personnel and above. Researchers assigned to SCP-4016 are to rotate visits to its chamber on a weekly basis, and provide SCP-4016 with a set of simple tasks to accomplish during the time between visits. Tasks that have resulted in a positive response from SCP-4016 include preparing vegetables for Site cafeteria use (e.g., peeling potatoes, removing husks from corn, slicing onions), keeping its chamber clean, and repainting small decorative items with faded colors. Any interactions of note are to be recorded and submitted to the head researcher for the SCP-4016 project. Description: SCP-4016 is a sapient humanoid construct made of twine. The entity stands at approximately 15 cm in height and weighs approximately 10 grams. SCP-4016's primary anomalous effect is its ability to manipulate the twine composing its body to create various tools for different uses, including cleaning implements, artistic styluses, and simple weapons. Despite not possessing any identifiable sensory organs, SCP-4016 is able to respond to both visual and auditory communication. It is able to interact with humans through a combination of pantomime and symbolic representation using its twine. On June 28th, 2003, local town authorities in Pinetucky, Alabama were alerted to a 'rotting stench' emanating from an old farmhouse. Foundation personnel posing as police officers were sent to investigate. Upon entering the farmhouse, said personnel discovered approximately 50 deceased house mice, 0.25 kilograms of kokedama jute twine, and SCP-4016 within the unstacked hay scattered around the building. The lead investigator, Agent Everwood, was able to convince SCP-4016 to accompany him to a Foundation safehouse (see transcript of accompany). Agent Everwood: Jesus Christ, this stench! Agent Everwood: Who did that? Identify yourself! Agent Everwood: Who are you? Is there anyone else here? Agent Everwood: Oh, that's… terrible. Why are you up there? Agent Everwood: The mice killed your friends? Agent Everwood: [Slowly walks over to the mouse. The mouse, upon noticing him, scurries and hides in a corner.] See, they're afraid of me. We have nothing to fear. Agent Everwood: So whatcha want to show me? Agent Everwood: [Reading off the tag] "Joey?" Agent Everwood: You all lived in the little houses? How did you all get here? Agent Everwood: Me… your friends… from the hay storage? Someone made you out of hay? As a guard? [under his breath] You'd wonder why not a cat or dog, to keep the mice out. Agent Everwood: A girl? She asked you? She was allergic to animals? Is that why she needed you to keep them out? Agent Everwood: She was sad about the hay? Agent Everwood: What exactly happened here? Agent Everwood: You killed it? Agent Everwood: Oh, I'm fine. You don't need to do that. Agent Everwood: What should I do with this? Agent Everwood: Oh, I can't… I can't bring them back. Investigation into the identity of SCP-4016's creator, as well as any other existing instances, is underway. Foundation personnel remain stationed at the barn in case of any returning homeowners; the dog tags and twine piles recovered from the barn were moved to Site-32. Upon SCP-4016's initial transfer to Site-32, entity was observed to be frequently agitated, and would compulsively pantomime requests for some form of work to carry out (cleaning, guarding, etc.). After researchers observed the twine composing the entity beginning to deteriorate, it was proposed that SCP-4016 be given its former task of exterminating mice. SCP-4016 was presented with a domestic house mouse in its containment chamber. Upon noticing and identifying the mouse, SCP-4016 manifested a twine whip and restrained the rodent. However, SCP-4016 then paused in its actions and retreated from the mouse. SCP-4016 then returned to stand next to the researcher present. When asked if it wanted to continue, SCP-4016 repeatedly shook its head, placed the twine whip on the floor of the cell, and held both of its hands out towards the researcher. The mouse was removed from the containment chamber, and researchers assured SCP-4016 that they would find new tasks for it to perform. Various items were later brought to SCP-4016's containment, taken from the farmhouse adjacent to the barn SCP-4016 was first discovered in. SCP-4016 seemed most interested in the foodstuffs and small decorative keepsakes, and manifested various tools to indicate its intent to assist with the objects. As of early 2004, most of the deterioration damage SCP-4016 suffered upon initial site transfer has been repaired. A small portion of twine over its chest remains slightly frayed, but appears to be recovering at a steady, if slow, pace. SCP-3994 - Normal Human People "ただの人間"
Special Containment Procedures: SCP-3994 is currently being held onsite at Site-92. The doors to SCP-3994's containment chambers must be pressurized as to prevent instances from maneuvering through gaps between the door and its frame. Instances are to be separated by category into their respective containment chambers in groups of no more than 15 per chamber. Should the number of instances in any given category exceed 800, termination of up to 500 instances may be permitted. Termination of an instance of SCP-3994 requires 87% of its mass to be completely destroyed, whether by incineration of 800 degrees Celsius, dissolution by an acid of 1.1 pH or less, or a detonation of 415 megajoules of trinitrotoluene. Recategorization of instances should occur bimonthly. Foundation webcrawlers must consistently monitor upcoming meteor showers and databases of medical facilities in order to track uncontained instances of SCP-3994. Mobile Task Force Theta-991 ("Human Beings") is to be deployed wherever reports of SCP-3994 surface, and instances of SCP-3994 must be apprehended under the guise of relocation to a private medical facility. SCP-3994 is to be provided a maximum of three times daily with Foundation-generated or heavily altered media (see Addendum-03). All media is to be centered around human activity and regarded as acceptable behavior for humans, regardless of the nature of the content. Incoming information from outside instances or sources must be immediately substituted with aforementioned media. All personnel who interact with any aspect of SCP-3994 or files regarding it must undergo a blood test prior to entering and exiting the containment chamber as to prevent allowing the incorrect personnel from exiting. Description: SCP-3994 is the collective designation for a cluster of extraterrestrial entities, currently consisting of SCP-3994-A-1 through SCP-3994-C-██. Instances of SCP-3994 have been grouped into categories A, B, or C based upon degree of shell decay, with A having no signs of shell decay, B having any amount of shell decay but with a retained shell, and C lacking any shell. SCP-3994 develops and inhabits outer skins (henceforth referred to as 'shells') that resemble human beings. SCP-3994 will favor mimicking the appearance of a preexisting individual in its immediate vicinity if it lacks a shell; if no human is present, shell formation will occur regardless. These shells are assumed to act as disguises to hide the inner form of SCP-3994, but often fail to perform as intended; 68%5 of attempts by SCP-3994 to form humanoid shells have resulted in various deformities, including but not limited to twisted appendages, severe malformation resembling elephantiasis, disproportionate skeletal structure6, and ██████████. The interior composition of SCP-3994 is of an unknown viscous substance. Without a shell, the bodies of SCP-3994 lack any confined form or structure, and may have a height upwards of 560cm. In this state, SCP-3994 maneuvers by dragging itself across a surface using any number of its limbs8. 96% 65% 38% of conversations held between Foundation personnel and instances of SCP-3994 have shown that SCP-3994 will actively copy the speech patterns, dialects, and languages of those whom they are exposed to; however, SCP-3994 demonstrates a great deal of difficulty in stringing together grammar and syntax, and has displayed symptoms in line with those of speech and communication disorders, notably cluttering and apraxia of speech. Instances under Foundation custody have shown to be adapting rapidly to match the language proficiency of personnel; countermeasures have been implemented to combat this (see Addendum-03). Discovery: Initial discovery of SCP-3994 occurred after news stations in ████, Bolivia, ██ ███████, Germany, and █████, Madagascar reported dozens of wild animals having been shred to pieces with pulpy, viscous innards of a solid, uniform color10. Samples taken from deceased instances proved to be extraterrestrial, with no known relatives existing on Earth. Several days prior to the initial discovery, all three cities had experienced a minor meteor shower. Meteorites retrieved near recovery locations have tested positive for DNA samples of SCP-3994, implying that SCP-3994 has been utilizing meteorites as a method of travel from their location of origin. Addendum-01: On 1/6/████, 3 of the ██ total B-category instances of SCP-3994 progressed into a complete state of shell decay, hereby recognized as C-category. Crevices in B-category shells with protruding limbs, spines, and other appendages gave way to the full interior body of these SCP-3994 instances, effectively dissolving the shell. Testing suggests that shell decay is a natural process, with signs beginning 1-4 months after a shell is initially formed, and dissolving entirely within 1 year. The process of shell formation takes a maximum of 3 days. There is no known way to inhibit this process. Foreword: SCP-3994-A-7 was recovered from ██████, Ireland three days prior to the interview. SCP-3994-A-7 was recorded to have been initially disregarded as an intoxicated townsperson until it was seen to have "snapped its elbows back in half and kept going about its business". Once it was administered medical treatment, hospital staff discovered that SCP-3994-A-7 lacked any human bodily fluids, and the Foundation was subsequently involved. Dr. Koffman: Good morning, SCP-3994-A-7. Dr. Koffman: Do you find something sickening? SCP-3994-A-7: It's an understandably, stand, standing rotten day! Dr. Koffman: What's making it rotten? SCP-3994-A-7: No breakfast, and time for breakfast. Eating is a man must eat, you know12. Dr. Koffman: Are you… are you hungry? SCP-3994-A-7: Feh, hunger be hungry. And you, what was breakfast for yourself? Dr. Koffman: I had… waffles, I believe. SCP-3994-A-7: Waffles, I believe! Oh, I endear waffles, I believe. They are, how'd you say, hungry for breakfast! Dr. Koffman: Do you know what a waffle is, A-7? SCP-3994-A-7 pauses briefly. It gazes distantly, then clears its throat. The following lines from SCP-3994-A-7 contained several words of Argentinian Spanish, which have been translated into English. SCP-3994-A-7: A waffle, I believe, is a bread pastry often eaten with… (unintelligible)… syrup for breakfast. Humans — us, we, enjoy them! Popular here, in… Argentina. Dr. Koffman: A-7, we are nowhere near Argentina. Extraneous dialogue has been removed. Closing Statement: Dr. Koffman's interview with SCP-3994-A-7 has led to the discovery of telepathic communications existing between instances of SCP-3994. Further research is being conducted in order to understand the limits and capabilities of this. Addendum-02: Following Interview Log-013, SCP-3994 is confirmed to develop language proficiency, cultural understanding, acceptable social behavior, and other essential components of human interaction not only by interacting with humans directly, but also by communicating information between one another in a hive mind complex. Dampening this development by teaching SCP-3994 false information about humanity is necessary to uncover instances of SCP-3994 embedded in human society. Amnestics do not function as intended due to the composition of SCP-3994. Incident Log-04: On 8/12/████, a security breach was attempted by SCP-3994-A-7, -A-24, -A-33, -B-3, -B-78, -C-16, and -C-27. -C-16 and -C-27 provided aid to the breach by pressing themselves between the crevices of the containment chamber door and the door frame to forcibly unhinge the door. They then functioned as a distraction by blocking off guards from accessing one side of the hallway leading to SCP-3994's containment chamber; guards were unable to destroy enough of -C-16 and -C-27's mass in order to surpass them into the hallway. Remaining instances of SCP-3994 had formed shells resembling onsite staff and security prior to the incident. Both B-category instances were able to conceal any protruding appendages by wrapping them in shreds of cloth taken from each other's uniforms. The group of A-category instances acted in the roles of personnel escorting wounded researchers to the medical bay. The security breach lasted a total of 23 minutes before all violating instances of SCP-3994 were terminated via heavy artillery fire. Incident Log-09: On 9/16/████, a breach was attempted by 14 A-category instances, 37 B-category instances, and 6 C-category instances. Dr. Koffman and 4 accompanying security guards approached SCP-3994's containment chamber, which caused the aforementioned instances to swarm around the door; it should be noted that this behavior is abnormal for SCP-3994. Dr. Koffman opened the door, and the 4 security guards were promptly trampled by the offending instances. However, all instances wove around Dr. Koffman, who headed in the opposite direction from the group until he was subsequently apprehended 11 minutes after the breach. The instances managed to reach the center of Site-92 before all were successfully terminated via a contained flood of 20,000 gallons of battery-grade sulfuric acid. █████████博士: コフマン博士、今日の君の行動は一体どういうことだね？君は警備に警報も出さずに重大な収容違反から歩き去っていったようだが。Dr. Koffman, what reason do you have for your actions today? You were seen walking away from a massive containment breach without alerting security. Foreword: The following interview occurred immediately after Incident Log-09: 9/16/████. At the time of recording, Dr. █████████ was the site director for Site-92. Dr. █████████: Dr. Koffman, what reason do you have for your actions today? You were seen walking away from a massive containment breach without alerting security. Dr. Koffman: I apologize, I must've forgotten. Dr. █████████: Forgotten? Dr. Koffman, you were being swarmed by SCP-3994. I don't want to punish you for initiation of and deliberate failure to contain a breach. Hell, I don't even want to blame you for what happened, you just opened the door. But they were all over you, Koffman, they trampled the guards and headed straight for escape, and you forgot? Dr. Koffman: Again, I apologize. I only did what I could. Dr. █████████: Excuse me, Koffman? Dr. Koffman: You can't keep them here forever. They've taken the form of the dominant species on the planet, and they're damn near indestructible by our means of measurement. We haven't found them all. We don't know how many there are. You don't even know how they multiply. Dr. Koffman: You keep an army trapped inside these concrete walls and it won't do a thing in your favor, Dr. █████████. They learn, and then they keep advancing. It's a simple concept. Buffers on their development will stop working. Sooner or later, there'll be enough instances on this God-forsaken planet to teach them every language under the sun. They'll learn the games. They'll know that humans don't actually eat paste for breakfast, or wear their shoes on their hands, like you so desperately want them to believe. Soon enough, they'll be walking and talking like any other person. And at the rate they're going, they'll outsmart us a million to one. They just keep going, and going, and going. You've wagered a hefty bet against the universe's greatest conquerer, Dr. █████████, and it's a bet you're going to lose. Closing Statement: Several hours following the interview, it was discovered that Dr. Koffman had been on vacation for the past two weeks. SCP-3365 is to be kept in a large chamber in Vacuum Containment Sector of Site-15 at all times, accessible through an airlock, which is to be sealed when SCP-3365 is not being researched. All air is to be removed from the containment chamber if any hatches on SCP-3365 are to be opened. Additional airlocks are to be sealed in the halls nearby SCP-3365’s chamber, in the event of a hull breach on SCP-3365. All researchers wishing to access SCP-3365 must enter the containment chamber through the airlock and wear a pressurized environment suit (PES). All sources of flames are prohibited from entering SCP-3365, or its containment chamber. Both hatches on SCP-3365 must be closed before any researcher leaves the chamber. All satellite imagery containing SCP-3365-1 are to be visually edited to remove SCP-3365-1. MTF-Tau-95 "Moonwalkers" are to be used if an incident occurs with the containment of SCP-3365 or SCP-3365-1. Description: SCP-3365 is a NASA Lunar Excursion Module, previously located inside an abandoned warehouse in ████████, Florida. 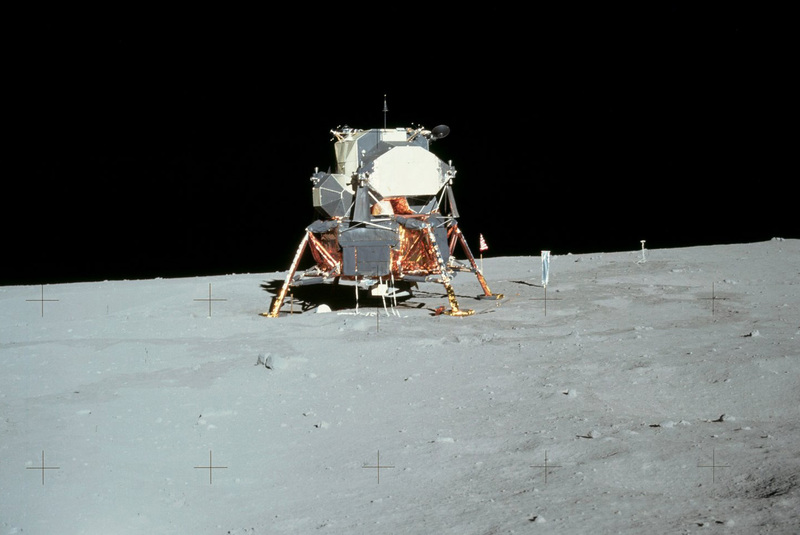 The exterior has the exact size and specifications as the lunar modules used during the Apollo program, except having minor damage, due to its long period of abandonment. All instances of the words “NASA”, “National Aeronautics and Space Administration”, “United States”, and “[DATA EXPUNGED]” have been either removed manually, or have worn off. The fuel tanks are constantly empty, and no fuel will be accepted. The interior of the module is also equal in appearance to the original modules, except it has a second exit hatch on the alternate side of the entrance. Travelling through this second hatch leads to the lunar surface, exiting from a lunar module with equal appearance to SCP-3365, without any exterior damage. This module is to be known as SCP-3365-1. The lunar surface has an American flag planted in the ground and a Lunar Roving Vehicle with seemingly limitless electricity to power it. Satellite imagery suggests that SCP-3365-1 is located in Mare ███████████ or Sea of █████████. Three human skeletons, as well as testing instruments, have been found on the lunar surface. Two of which were found wearing an Apollo/Skylab A7L spacesuit, while the other was wearing a lab coat with the NASA logo embroidered on the front pocket, as well as the name R█████ L███████ sewn onto a patch underneath the logo. Addendum-3365-1: On ██/██/██, before current containment procedures were enacted, Dr. W██████ entered SCP-3365 for research of the SCP-3365-1 and the lunar surface. Seemingly on accident, Dr. W██████ opened both hatches within SCP-3365. This allowed unblocked passage of air from Site-15 and the lunar vacuum. This caused decompression Site-15's Wing D, until it was stopped by the use of the emergency lockdown, sealing Wing D's entrances. MTF-Tau-95 was sent in, wearing pressurized environment suits, to seal the hatches on SCP-3365. SCP-3365 was promptly relocated to its current location, and had its containment procedures changed. 5. Percentage has shown to increase in the absence of a replicatable human subject. 6. SCP-3994 lacks a skeletal structure; all apparent bone malformations exist only in the skin of the shell. 8. No upper limit of limbs or appendages has been noted. 10. Since this initial discovery, no instances were found to have developed an inhuman shell, likely due to rejection by inhuman mammalian societies. 12. SCP-3994 does not require food and is presumed to be self-sustaining. SCP-3994-A-7's comments are theorized to have been the scrambled words of individuals in its location prior to recovery.